Searching for Penguin quotes and sayings. If yes, now you don't need to search for them anymore. 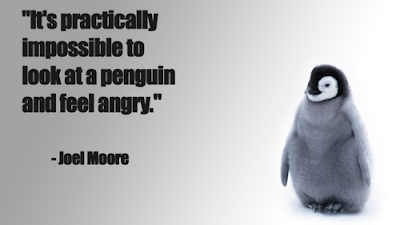 As here I have compiled down some of famous, funny and lovely quotes about penguins. Just hope you like the quote compilation and find those words which you are looking for, to express your feelings about penguins. I've never been in love, but if a penguin can find a soul mate, I'm sure I can, too. I suggest we depict penguins as callous and unfeeling creatures who insist on bringing up their children in what is little more than a large chest freezer. Did you know that when a penguin find it's mate, they stay forever? Will you be my penguin? It's too dam hot for a penguin just to be walking around.